I had a couple of friends ask me for a few of the highlights I encountered during my recent trip to Japan – which covered Tokyo, Hakuba and Kyoto, with side-trips to Nara and Himeji. While by no means exhaustive guides to the things to see and do in each city, I hope the following helps you get that little bit more out of your holiday! Pro tip: Stuck for somewhere to eat? Find a train station. It’s the opposite of what you’d do in the West, but generally you’ll find the greatest concentration of late-night eats, izakayas and more near these hubs. On my fourth trip to Tokyo, I stayed in Shibuya and only wandered as far north as Shinjuku. So my recommends are very much slanted to the western side of the city. Faithfully made espresso coffees and… Cronuts! On Cat St, which is a lively shopping walk from Shibuya to Harajuku. Very quiet prior to 11am. Didn’t go here personally, but some of my friends really rated it. One for the list for next time! Amazing ramen, close to Shibuya Station. Like many a great ramen place, you order from a machine near the front door, by adding money first, then selecting what you want from the pictures. Hundreds of 3-6 person bars, catering to every theme and atmosphere. You may not be allowed in all of them as a non-Japanese speaker, but we had a great night at Bar Plastic Model; check Foursquare for tips. My friends are obsessed with this place. Really imaginative dishes, cocktails and yes, you get served by ninjas. I was a bit sore to not get a chance to go. If you have the time, go. It’s enchanting and in a really relaxed neighbourhood, a great reprieve from inner-city Tokyo. The area around the Senso-ji template always has a festive atmosphere. Great place to buy gifts, too. Seriously, all the crazy Japanese snacks, toys and outfits. And decent goodies too, like quality thermos flasks and coffee making gear (good for the snow). If you see what looks like a multi-storey dollar store just bursting with cartoon bear, frog and dinosaur outfits, you’ve likely found your local Don Quixote. One of my favourite places in Tokyo. Be prepared for a long walk in, but how peaceful it is! A gorgeous contrast to the Sunday gang and general frolic of Harajuku. The skiing here was out of this world this season. If you have a rail pass, getting to Hakuba will take you ~3 hours by shinkansen and bus from Tokyo. If you don’t, you can catch a scenic, but slow (4.5hrs) bus from Shinjuku Bus Terminal for ¥4,850, which is significantly cheaper than the shinkansen. I highly recommend staying at Hakuba Ski-Kan, less than 5 minutes walk from Hakuba Bus Terminal. If you stay there, you’ll get a steep discount at Woody Ski Rentals directly across the road. Using this deal, our skis, boots & poles came to ~¥1500/day, a bargain! Ski-Kan also has a good onsen and drying room for your ski gear, both of which you can use for free as a guest. Honestly, I couldn’t find good espresso. Thankfully, I love hot coffee in a can, especially UCC coffee. Couldn’t find the UCC in this neighbourbood, but you will find a coffee vending machine for all your pre-ski needs at Hakuba Bus Terminal. Ok, recommending a convenience store may seem a bit silly, but trust me… You’re going to find yourself tucking onigiri (rice balls in seaweed) into your ski jackets practically every day. And stocking up on sake and candies. The Lawson stores are absolutely buzzing during ski season with thrifty ski bums like us – good thing they’re open 24/7. My favorite izakaya in Hakuba. Great set menus and hearty food. Expect to wait for a table. Foreigner-friendly izakaya, with great sukiyaki and shabu-shabu set menus. Another great izakaya that’s good with groups. Good place to find bars and izakayas. And Aussies. Just warning you now. All the ski resorts below are serviced by shuttle buses from Hakuba Bus Terminal. Happo-one buses circle the village and are free, while Hakuba 47 & Goryu’s free shuttle leaves HBT every 30 mins or so. Buses for Cortina are ¥500 and leave HBT hourly. Happo-one – The easiest ski resort to access, has a really great variety of runs for all levels. On the north side of the peak (right-hand side of map) is where you’ll find the powder. Hakuba 47 – Personally, my favourite, as there’s jumps of all sizes, lots of slightly off-piste stuff to do and a terrain park. 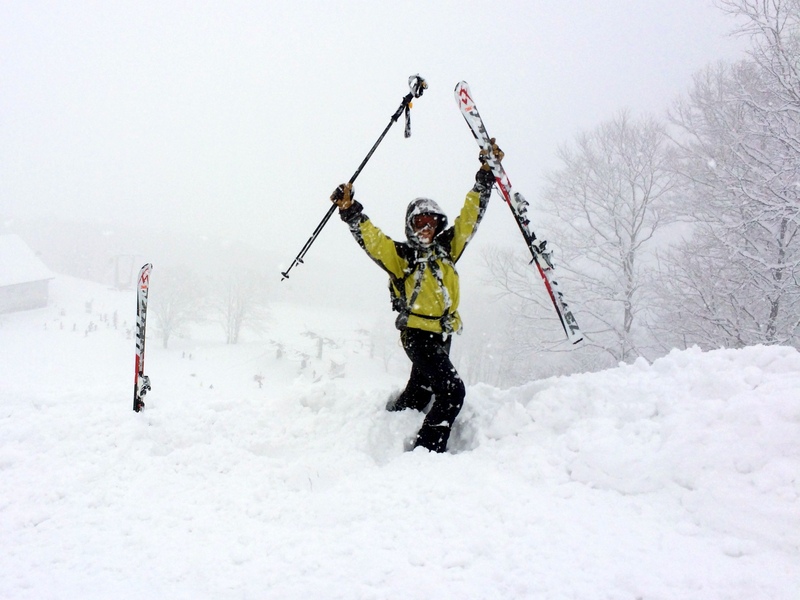 Goryu – Connected to Hakuba 47, this area largely caters to beginners, so tends to be a mess. Missed it without regrets this year. Cortina – Come after it snows for first tracks around ~8:15am. A lot more challenging terrain than the former resorts and if you’re a terrible powder skiier like me, lots of opportunities to “learn” (ie. get bogged repeatedly). Food and lift tickets are more expensive than the forementioned resorts, but on the upside, it has an excellent onsen overlooking the resort. Snow monkeys! A couple of tour groups offer snow monkey, sake & Nagano temple combo day trips for Y10,000/person. You can book via your hotel or Hakuba Bus Terminal. I had a group, so hired a bus from Alpico Taxi (thanks to the Hakuba Bus Terminal team), which worked out to be significantly cheaper. Really great thing to do during bad weather/rest days. Hands down, the best outdoor onsen in Hakuba. On clear days, you can see out to Happo-one; it’s unbelievable. It does get busy, though; perhaps use your hotel’s onsen first, if you’re not used to the routine of getting naked, washing thoroughly, then jumping in with strangers. It does become one of the most enjoyable things to do after a big day of skiing, though! This was the most enchanting part of my trip; I’d never been to Kyoto before and I sure as heck didn’t want to leave. From templates to trendy shopping strips, this town has everything. Excellent coffee in a very hip department store. You’ll dig this. This is the place. The bartenders here are national cocktail champions and everything that follows is 5-star. It’s the epitome of Japanese hospitality. Cocktails are ~¥1,000 and the staff can translate the menus for you. A whiskey-oriented bar where the staff are slightly surly and you will be hit with a ¥500 “seating fee”. But it’s beside the river and a quiet place to pass the time with a drink. 8 ramen restaurants, each representing a different region of Japan. It’s tucked away inside Kyoto Station, but the adventure is worth it. Short directions: Find Isetan JR Department Store in Kyoto Station (West Zone). Kyoto Ramen Koji is on the 10th floor, via the Station Building elevator. I tried the Hakata Ikkosha ramen; funnily enough, they also had the best JFC (Japanese fried chicken) I’d had all trip. Wasn’t quite enough adventure for you? Visit this extremely local sushi bar near Nishioji Station and ask for “omekase, arigato”. The staff will then proceed to make their choice of delicious sushi and sashimi dishes, until you plead for them to stop. The sake is excellent too. Honestly, this was the best sushi I’ve had in my life and it came to ~$30/person. You’ll be hard-pressed to find cod milt (白子) sushi outside of Japan, too; its quite the experience. Pro tip: Start your sightseeing with Higashioji-dori – from Higashiyama Station, head south. Or head to Fushimi-Inari early to beat the crowds (via Fushimi-Inari or Inari Stations) and head north after. Unmissable temple and wow, what a scenic walk! 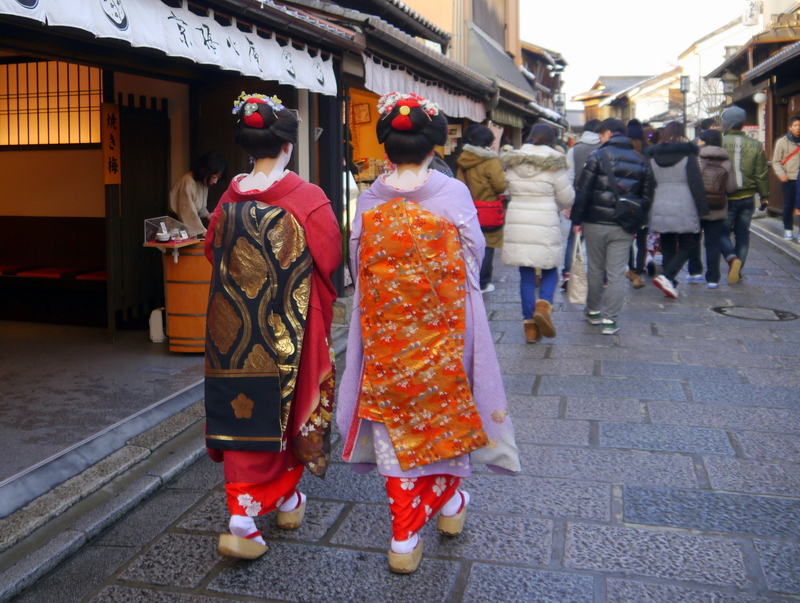 We saw two maiko flitting between unique tea and dessert shops, temples and pagodas. It’s the Japan of postcards in here. We did this walk in reverse all the way from Fushimi Inari-Taisha (with a cab ride to skip the not so interesting bits between much of Fushimi Inari and Kiyomizu-dera). Thousands of vermilion torii gates lead you up the 2-hour hike up Mt. Inari… Then, there’s the walk back. Even if you don’t make it right around the loop, you’ll find breathtaking views of Kyoto, unexpected ramen restaurants to power you through and occasional pockets of solitude. I need to go here – the photos make my heart ache. Didn’t make it, still kicking myself. This too. I love castles. I have to go back. Wahh. 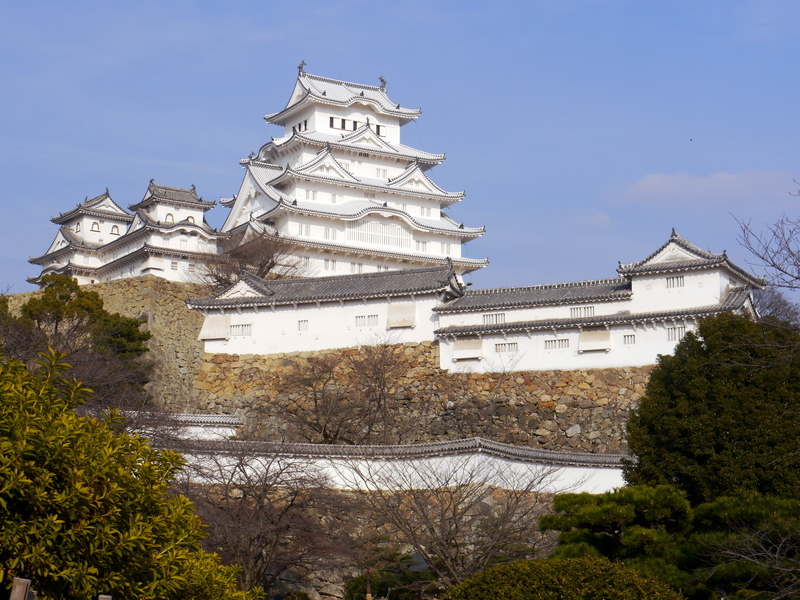 Himeji castle – If you have a JR Rail Pass, take the 1 hour shinkansen ride to see Japan’s most elegant castle. Nara – The big buddha at Tōdai-ji temple is absolutely stunning. So are the deer in the surrounding park, if you goad them with food into harassing you. As I discovered, not ideal to visit in torrential rain, but still satisfying. Roughly 45 minutes by train from Kyoto Station.